I am taking part in a twelve week on line journal class, “Creative Mixed Media Journaling Techniques” with Sue Bleiweiss. Each session is two weeks long. The first and second week, we were instructed on how to create a handmade journal that will hold all of my soon to be created background papers. The journal is ~9″ x 12″ and has three rings to hold the completed papers. Although the journal is hanging in this photo, you actually turn it clockwise and open it up on the right hand side just like a regular notebook. This fabric is a Bali hand dyed cotton. 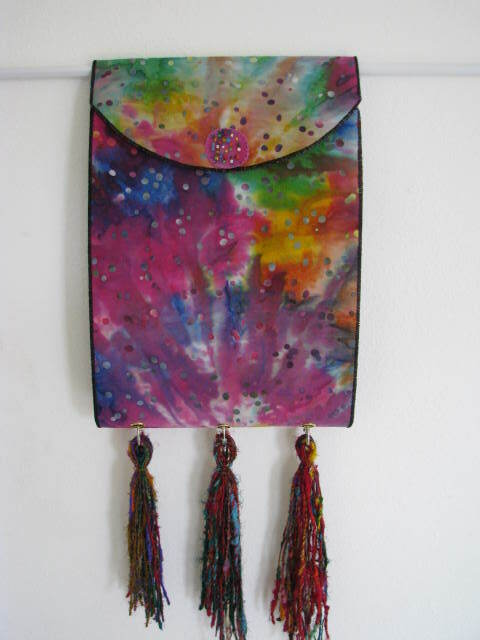 The tassels are made from silk sari yarn. I looked for a pre-made button to use for the closure, but didn’t find anything in my stash that fit so I made this one. I cut out a circle of the Bali fabric and placed it on a circle of Timtex. I then sewed on each bead, anchoring each one so they don’t fall off. I used a blanket stitch with 3-ply cotton floss to add it to the flap. The beads match the random-ness of the dots on the fabric. 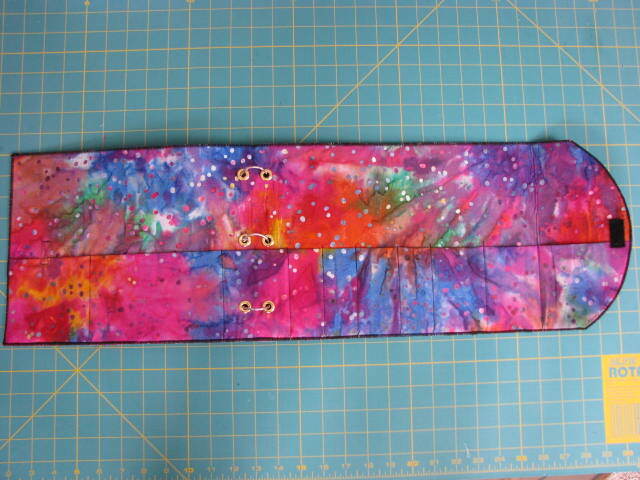 This is the inside of the journal with lots of pockets to hold pens, pencils and other art supplies. On the right hand side is a piece of black Velcro that holds the cover together when closed. On to lesson 3 and 4, painted background papers. Stay tuned for more. This entry was posted in 2008 and tagged art journal. Bookmark the permalink. Oooooh! This is gorgeous! What a treasure! Good Lord! That is awesome looking! What a great job. This is really beautiful. I love the ring binding in it! And what gorgeous fabric! A friend of mine took one of Sue’s classes and really enjoyed it too. Great work!